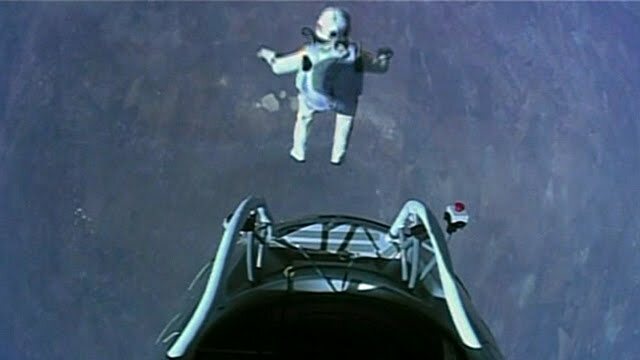 Austrian skydiver Felix Baumgartner has created history by successfully jumping From The Edge Of Space at supersonic speed today (14th October 2012). Felix Baumgartner breaks the record for the highest ever skydive by jumping out of a balloon 128,000ft (39km) above New Mexico. Video cameras relayed the moment Baumgartner stepped from his balloon capsule to begin his fall to Earth. It took about 10 minutes for him to reach the desert surface below. Helicopter recovery teams have gone to the Felix Baumgartner's landing site to return him to the mission control centre set up at Roswell airport. You need to read my previous post if you want to know the details about this mission and to know about Felix Baumgartner. Watch below the Highlights of the Felix Baumgartner's supersonic freefall from 128k'. The space jumping mission was shown as Live on YouTube. And, this YouTube Live too created a record of highest ( more than 8 Million) concurrent views of Live Video. And, you can watch the below video showing details about Felix Baumgartner. Watch below video showing inspiring Quotes of Felix Baumgartner.